Having just finished reading the book, I think a D+ is a bit harsh. One has to take into account that NO book was going to be another Mockingbird. Not only that, the review has its facts wrong. It says Atticus is a card-carrying member of the KKK, which is not in the book. The book says that back when the KKK first started and was a simply political organization, that he joined simply to find out who the other members were. It is implied that he did not continue to attend meetings after that. Atticus says you can’t fight what you don’t understand. Doesn’t sound like a card-carrying member to me. Well, I read it in two days and if it stunk, I couldn’t have read it so fast. It was compelling enough for me to read right through it. The review says it’s a more accurate reflection of the 1950’s South than Mockingbird. Which I guess is true seeing how Mockingbird took place during the 1930’s. Seriously, who proof read this review? Hell is an eternal apartness. What had she done that she must spend the rest of her years reaching out with yearning for them, making secret trips to long ago, making no journey to the present? I am their blood and bones, I have dug in this ground, this is my home. But I am not their blood, the ground doesn’t care who digs it, I am a stranger at a cocktail party. Prejudice, a dirty word, and faith, a clean one, have something in common, they both begin where reason ends. Is the book a little choppy? It can be. Scout seems to drift from where she is to memories of her childhood with ever increasing frequency. Most of these memories are of her, Jem and Henry (aka Hank) Hank was Jem’s best friend growing up and at the onset of the book, a hopeful suitor of Scout’s. I like the idea of Henry, a character that isn’t introduced in Mockingbird because he never spent his summers in Maycomb, but spent the school year there. You get some idea of who he is from these flashbacks, but not enough for me to really get a sense of him as a fully fleshed out character. I think what bothered me the most about this book was a lack of information on some things that really needed to be explored a bit more. Jean Louise has been living in New York for a number of years. What does she do there? What’s her profession? Does she have friends? The book never elaborates in the slightest about her life up among the Yankees. Very little is said about Jem’s death. You find out he died in the very beginning of the book, but the only explanation you get is that he died of the same heart condition as his mother. I’d have liked a bit more than that. The crux of the book is that Jean Louise arrives in Maycomb thinking all’s well, only to find out her father and prospective fiancé are members of a citizens council that’s pro-segregation in all it’s horrors. While Atticus’ explains his presence there, Henry never gets the opportunity to explain why he’s there to my satisfaction. He’s supposed to be this great guy, but all he says in his defense is that if he didn’t go to the meetings, he wouldn’t be able to be a lawyer in town, that he’d be no good to anyone. Basically, peer pressure of a sort. True as that may be, if he was half the man Jean Louise thought he was, this doesn’t seem likely. So is he weak-willed, or is it something else? The book seemed thin here for me. I feel that in the end, Jean Louise is meant to break from her father and be a person able to fully stand alone, a woman finally set apart from the hero-worship that had overshadowed their previous relationship. This felt like the major theme in the last pages of the book, but in a way I felt as if Harper Lee was sending a greater message, one that said to the readers of Mockingbird, don’t put Atticus up on a pedestal, he’s a man, a good man, but a fallible human none the less. 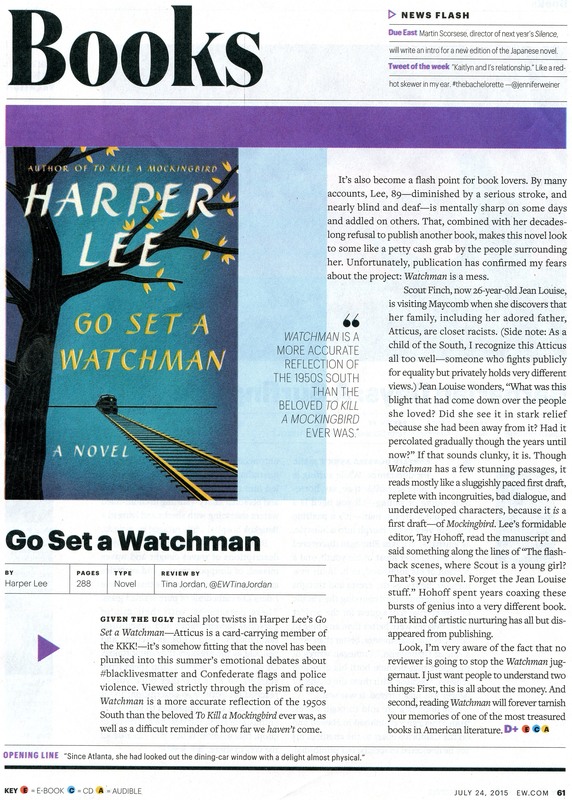 The Entertainment Weekly review ends by saying “reading Watchman will forever tarnish your memories of one of the most treasured books in American literature.” Perhaps Miss Lee was trying to say, don’t hold any man or book up on a pedestal. 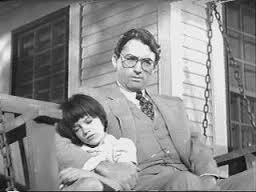 Don’t let Watchman ruin your thoughts on Mockingbird, let them show you that even a man like Atticus Finch is just a man. Imperfect in all his idealism, a reflection of the best there was to be had in a dark time in American History. Jennifer Geoghan, author of The Purity of Blood novel series, and If Love is a Lie: Finding and Losing Love Online.